He signed the deal with Rene Berkvens, CEO of Damen Shipyards Group. Mohamed Meer Abdelrehman Al Sarrah, director of seaports and customs, was present. These vessels will be built in Sharjah and delivered by June next year. The signing ceremony took place at Sharjah Airport International Free Zone recently. Sheikh Khaled said the department had a long-standing relationship with Damen since all of its tug boats were supplied by them. “This is the first time we will be taking delivery of vessels built in Hamriyah Free Zone by Damen Shipyards Group. We are once again delighted to join hands with Damen and it still remains our first choice for tugs as they are able to meet all of our requirements,” he added. The Damen Shipyards Sharjah (DSS), located in Sharjah Hamriyah Free Zone, has the facilities to repair and construct all types of vessels. It has started delivering tugs, work-boats, support vessels, landing craft, floating docks, barges and pontoons, said Damen in a statement. 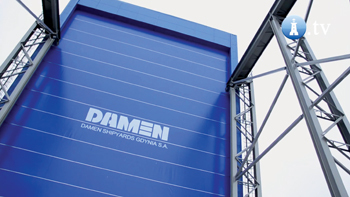 Damen Shipyards has a leading position in shipbuilding with more than 6,000 employees and a presence in 35 countries. Since 1969 it has delivered more than 5,000 vessels. On average it delivers around 150 vessels a year and keeps more than 150 hulls in stock to ensure a short delivery time. Each year it completes more than 1,000 repair jobs.